This post is to celebrate the movement of our Grade 1 and Grade 3 teachers. Since the introduction of the SAMR model a little over 6 months ago, our teachers have moved from using IT as a substitution to redefinition, where the tasks they are doing now could not have been done without technology. Our Grade 3s are just finishing a unit about energy - it's part of Sharing the Planet. Last year the central idea of this unit was: energy exists in different forms and is changed, stored and used in different ways. The focus was on electricity and in the IT lessons students used a programme called Crocodile Technology where they dragged and dropped icons onto the screen to create circuits. I'm assuming this was an on-screen version of something I once did years ago with circuit boards where students could create actual circuits using wires and batteries to turn on light bulbs and as such I would define this as substitution. The current unit has been totally changed - the central idea is now energy can be converted from one form to another. Students are looking at how all energy starts with the sun and how it can pass through a food chain giving energy to plants and animals, how these can die and form fossil fuels and how energy can be renewable. This year the students were using DoInk to make animations of how energy is converted and the focus has been on conservation. 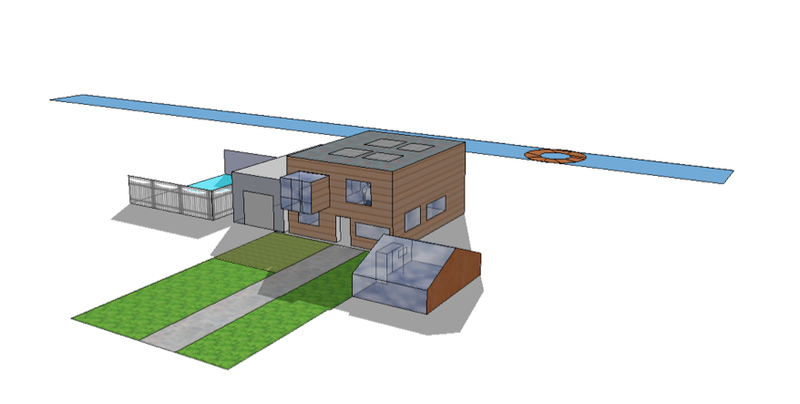 Students for their summative assessments have been designing energy efficient houses that would be suitable for building in one of three locations, Denmark, Switzerland or Australia. In order to inquire into building design they looked at the new middle school campus and met with the architect to ask about different design features. 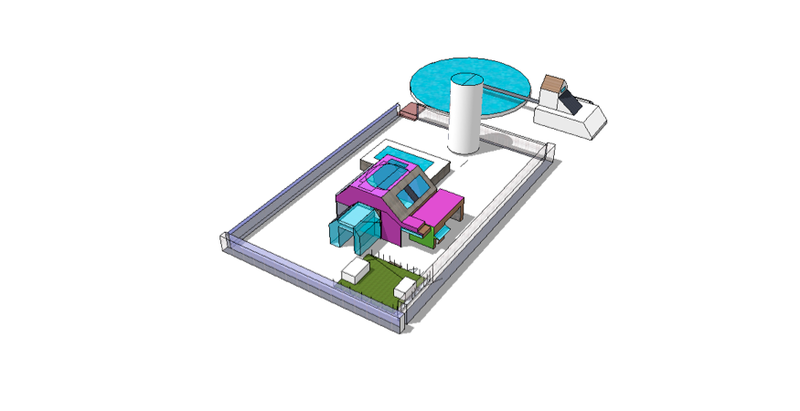 In the IT lessons and in their classrooms they used Sketch Up to then design a building for a specific location. Today one of our teachers pointed out that all students were able to use Sketch Up easily, in fact creating their houses was much easier than if they had drawn them by hand. The assessment itself could never have been done without the computer. Another plus I noticed is that learning to use this tool is leading very nicely into their next unit of inquiry: exploration. The central idea of the upcoming unit is: exploration leads to discovery and develops new understanding. When introducing this tool to one of the classes I was keen to use this vocabulary - therefore once the students had finished using DoInk I showed them how to find the software on the computer but gave them no instructions at all about how to actually use it or what all the different tools did. Instead I told them we were going to explore and find out what new things we could discover. Some of them discovered how to do some things, some discovered others. They shared these discoveries and made their practice buildings better. Some went home and taught their parents how to use it too. Our Grade 1 students have been moving forward too with their current unit of inquiry How We Express Ourselves. The central idea is performing allows us to express ourselves in different ways. Last year students spent quite some time recording each other reading using digital cameras and playing back what they recorded so that they could critique their own reading. This year we have used the teacher's laptop to record whatever performances the students chose to do. These were uploaded to YouTube and then embedded on the class blogs - which were new for all our Grade 1 teachers this year. We have taught the students how to add appropriate comments to the blog posts, and of course family and friends around the world have added comments too. The little performances the students did in front of their classmates have been viewed by others worldwide. Our Grade 1 and 3 teachers now all have their own class blogs. One of these teachers even has 2 class blogs (one for students to publish their writings, one for students to publish their performances). A couple of our teachers in Grade 3 have started quad blogging with other schools. Some are using the blogs as places where the students can do their homework. Parents and families are loving the interactive nature of the blogs. Students are learning how to be good digital citizens and what is and is not appropriate to publish. We have come a long way in a short time. These teachers are my shining stars. I would like to acknowledge the work of Dr Ruben Puentedura who has been the force behind SAMR. How does the child become qualified to make educational comments about another's writing? I worry about the kids identity on You Tube. Where do the privacy laws come in for their protection. Privacy is of course an issue. Thankfully YouTube has settings which allow videos to be Private or Unlisted (so they cannot be found when searching). Generally we have found that parents love seeing their children's work published and appreciate being able to share their creations with other family members in distant parts of the world. In any school there will always be parents who do not wish their child to be photographed, videoed or to have their work published, and of course we honour these requests. Hi Maggie! It's fascinating reading this several years on and reflecting on how the school has changed, or not changed in some ways. We have far more technology than we used to, but I'm not sure how much genuine redefinition we do, even with so much access. The kids are very, very comfortable with the computers and iPads, they blog, create animations using DoInk (I still have very fond memories of discovering that tool with you leading the class to investigate simple machines!) and certainly use technology as an essential tool for practice, learning, and sharing. Grade 5 has just received an iPad cart but very little thinking time has been given to how it can be used to enhance (and redefine!) the curriculum at this level- at the moment, it's rarely booked! That's definitely my goal this year - although I've just moved up to G5 instead of G4, so I'm wrestling with the new units as well. Possibly the best time to approach it - no preconceptions! Hi Katherine - have often thought of the expression "necessity is the mother of invention". When we had limited resources (one lab, little software, no money etc) we had to be really creative about what we used and how. 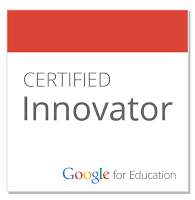 This led me to explore so many free online tools with teachers and students. I always think it is a problem to throw technology at people without first considering what we want to do with it - it's all about investigating, collaborating, creating, communicating - and we should focus on the learning first and then ask what technology will support that.